This article deals with the major groups of bacterial pathogens. Specific chapters in the textbook address many individual groups or members of a group. All groups are defined by at least one bacteriological criterion such as Gram stain, metabolism, morphology, spore formation, etc. However, there is often some genetic or phylogenetic relationship between members of a group. Although we organize bacterial pathogens into natural groups for discussion based on bacteriological criteria, rather than on the basis of affected organ, mode of transmission, or type of disease, two summary tables are provided at the end of this reading that identify bacterial pathogens of humans on the basis of specific bacterium, type of disease, and usual mode of transmission. When one searches for clusters of pathogens in the Bacterial Domain of the Tree of Life, they are found primarily among the Gram-positive bacteria and the Gram-negative proteobacteria. Most of the bacterial pathogens of humans are classified as Gram-positive or Gram-negative, but some notable exceptions include the mycoplasmas, chlamydiae, spirochetes and the mycobacteria. The spirochetes are a phylogenetically distinct group of bacteria which have a unique cell morphology and mode of motility. Spirochetes are very thin, flexible, spiral-shaped bacteria that move by means of structures called axial filaments or endoflagella. The flagellar filaments are contained within a sheath between the cell wall peptidoglycan and an outer membrane. The filaments flex or rotate within their sheath, which causes the cells to bend, flex and rotate during movement. Most spirochetes are free living (in muds and sediments), or live in associations with animals (e.g. in the oral cavity or GI tract). A few are pathogens of animals, occasionally transmitted to humans (e.g. leptospirosis). The two major pathogens of humans are Treponema pallidum, the agent of syphilis, a sexually transmitted disease, and Borrelia burgdorferi, cause of Lyme Disease, transmitted by the bite of the deer tick. Spirilla are Gram-negative bacteria with a helical or spiral shape. Their metabolism is respiratory and never fermentative. Unlike spirochetes, they have a rigid cell wall and are motile by means of ordinary polar flagella. Two important pathogens of humans are found among the spiral forms. Campylobacter jejuni is the cause of bacterial diarrhea, especially in children. The bacterium is transmitted via contaminated food, usually undercooked poultry or shellfish, or untreated drinking water. Helicobacter pylori is able to colonize the gastric mucosal cells of humans, i.e., the lining of the stomach, and it has been well established as the cause of peptic ulcers and there is strong evidence for its involvement in adenocarcinoma. The term vibrio refers to a Gram-negative bacterium which has the cell shape of a curved rod or a comma. Members of the genus Vibrio consists of common bacteria in aquatic environments, especially marine environments. They have structural and metabolic properties that overlap with both the enterics and the pseudomonads. Vibrios are facultative anaerobes (grow in the presence or absence of O2), like enterics, but they have polar flagella, are oxidase-positive, and degrade sugars in the same manner as the pseudomonads. In aquatic habitats, they overlap with the pseudomonads in their ecology, although pseudomonads favor fresh water and vibrios prefer salt water. Some marine vibrios are bioluminescent (they emit light) and some are symbionts of fish, squid and other marine life. Vibrio cholerae causes epidemic or Asiatic cholera which, untreated, is one of the most rapidly fatal infectious diseases known. The pathology is related to diarrheal diseases caused by the enteric bacteria, except it is relentless, and a patient can die rapidly from dehydration. The cholera toxin, which is the classic model of a bacterial enterotoxin, is also produced by some strains of E. coli. Figure 6. 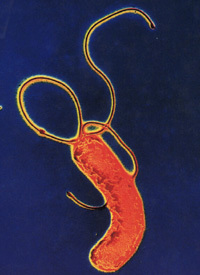 Vibrio cholerae, the agent of Asiatic or epidemic cholera.